How do these first Thursdays come around so fast?? I'm just a little off in the quilting realm right now. We were gone for a week doing daycare for two of our grandkiddies during their spring break. It was fun, fun, fun. Spring weather was trying really hard. It was kind of chilly at times, but we also had sun, so we were able to play outside, go to the park, hike at a forest preserve, and visit a cute little zoo of North American animals. (The bobcats were my favorite.) I did not quilt at all (which was just fine), but I did sew a bit with my granddaughter. We made more bracelets like the one at the end of my post from February 23. Anyway, Throwback Thursday just sort of sneaked up on me. I have a group of pictures of several quilts that I was going to share, but I think I'll keep this short and share just two. I came across these just the other day when I was packing up things for our daycare week. We still have bins of my daughter's things at our house. I thought it would be fun to bring one of them with us to share with the grands. (Okay, I'll admit it. I really wanted to get it out of our house.) There were lots of little treasures in there that would appeal to the kiddies--including my daughter's oeuvre. Well, that's a word I don't use often (ever?). According to my handy dictionary, it's the complete body of work of a painter, composer or author, and I assume it can apply to a quilter, too. Don't worry. This won't take long. She indulged me on these projects, I think, because she would have much preferred doing something more physical. This first one was probably made between 1986 and 1988. Oops! We forgot a label. I do know that the binding is from a quilt I made for a friend in 1986. I'm not sure what I used the other fabrics for--perhaps my craft fair quilts. 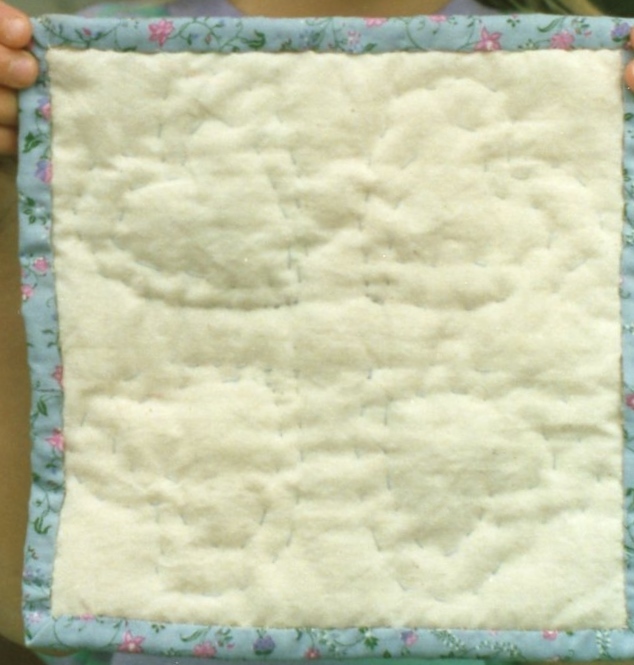 After getting those four blocks sewn together, She painstakingly quilted the double hearts in them. Aren't those just the cutest stitches? I bound it for her. And then she was done. With the quilt, yeah, but also, apparently, with quilting, Sigh. Good thing it was little. Here's the back. And here is a photo from when I took it out of the bin last week. The colors are truer in this second photo. I didn't think to measure the quilt. I imagine the squares are similar to mini squares that are available today. I have wracked my brain for the dyer--she was very popular in the 80's, but I just can't remember her name right now. Mardi or Marti, perhaps? I just don't recall, but those colors have held up very well. 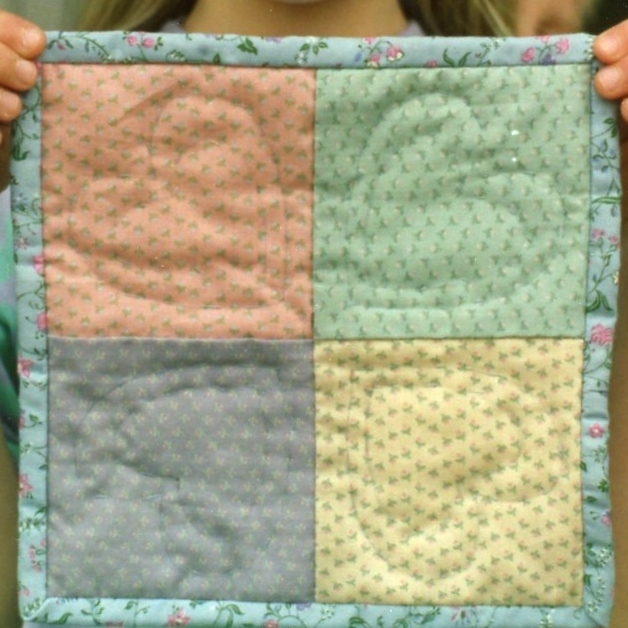 My daughter had the quilt on a shaded wall in her bedroom for several years before we moved to a new house. Now to be fair, this is not the extent of my daughter's oeuvre. Her new bedroom in the mid-90's had a sunflower theme, so we collaborated on a sunflower quilt that I showed in a previous TBT post here. She chose the fabric placement for the blocks, and I sewed the quilt. (She might have also sewed a few of the blocks, too, but not with enthusiasm, as I recall.) She has never lost her love of fabric, color and pattern. She has a really good eye for design, and has chosen fabrics for her home and for quilts for her family. I am more than happy to sew them up. It's a collaborative arrangement that works well for both of us. I see the same spark in my granddaughter. It was fun to watch her pet the little rainbow quilt and immediately identify her favorite squares when I took it out of the bin. I have a feeling it will end up on the wall or door in her bedroom. She loves to look through my fabrics, and a certain big box fabric/craft store is her latest happy place. She is a free-wheeling artist--much more spontaneous and improvisational than I have ever been. I have to keep that in mind when we sew together, because I tend to get bogged down in details. I don't know if she will become a quilter, but that's okay. She is having fun with color and art, and what more could I wish for. I'm linking up today with Andrée at Quilting and Learning--What a Combo for Throwback Thursday. She and Sandra at mmm! quilts will be alternating this linky party as co-hosts this year. Be sure to hop over to their blogs to see what they've been up to. And add something to the party if you can. I thought this might be my last TBT post, but nope. There are still a few loose photos of oldies to share next time. Okay, back to creating. I have been obsessed this week by a little quilt that's been in my brain for a few weeks, but now wants to become a reality. There is a possible timeline involved, so I'd really rather work on this than eat, sleep, read/write blog posts or anything else. You know how it is. I have Hands2Help quilts to finish, too, and aqua RSC blocks. Oh, my. What a lotta quilty fun! I will try to remember to take photos and share some of this stuff. Right now, I just want to sew!. I hope you do, too! Really cute quilts! What a great post. So neat that you have the opportunity to spend time with your grands and give your granddaughter something your daughter made. I wish I had been able to teach my daughter to sew. She was never interested until recently, and I am not a good teacher, so I've encouraged her to take a beginner class. But I doubt that will happen for awhile with a 3 year old and another due next month! I tried to get Julia interested in sewing too. Oh how I tried. But nope - no interest. Oh well. Such is life. On the other hand, Ian made a quilt one year with just about no help at all. He decided to make a patchwork flannel quilt for his GF at the time. It was fun to watch that and he did a great job. He was about 19 or 20? How great that your granddaughter is enjoying this time with you. Little surprise memories are so special. My daughter made a pillow top for the county fair and entered it in the 4H division, even though she was not a farmer. I kept it for so many years to remind me. After that start she became a wonderful sewer, making dresses, bridal gowns etc. you never know where things will lead with your children, but the memories are there. Hi Janine, those are really cute quilts. Thanks for sharing them with us on Throwback Thursday (yes, it surprised me too when it suddenly show up!) 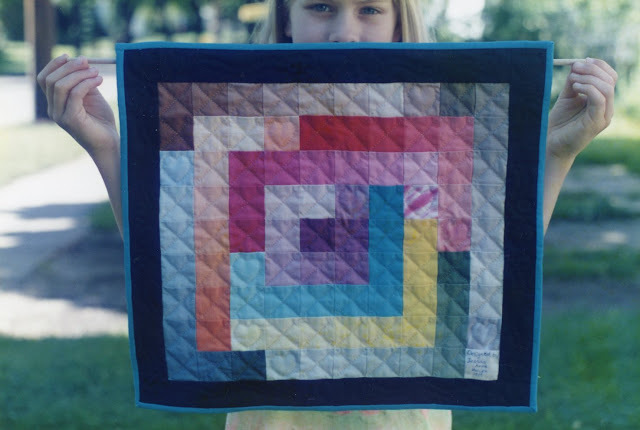 You might consider doing some improv piecing with your granddaughter! Ah, what a nice story! I also tried to get my kids interested in sewing, but no luck. They have since come around to the point where they will say, "Mom, can you make me. . ." My younger daughter is the only person other than myself that I'll hem pants for, but any day now I'm planning to tell her to learn herself or find a tailor. :) I love your granddaughter's reaction to the little quilt. It gives me high hopes for my own grandkids. Maybe my grandsons will be quilters?